What are the Best Protein Bars for Weight Loss? What are the best protein bars for weight loss? I can tell you that there are a TON of options. For me a protein bar for weight loss must be low in added sugar. While I wish everyone would choose an apple with peanut butter as a snack or a hard boiled egg - I get that people want something they can shove in a bag to help them get through the day (and keep them away from the office cookies). Flight attendants, especially, have written to me asking for options and I know that it must be hard to carry around fresh food all the time. I have waded into this territory with my thinkThin High Protein Bars Review and my Are Kind Bars Good For You? post BUT I had no idea how many new bars were out there. What? There are so many to cover that I decided not to write about the ones that I didn’t like. I found several of the bars that I bought completely inedible and my dog thought that they belonged to him. I am not kidding - he came running up after I opened a couple of the bad ones and would not stop barking. I would rather be positive! 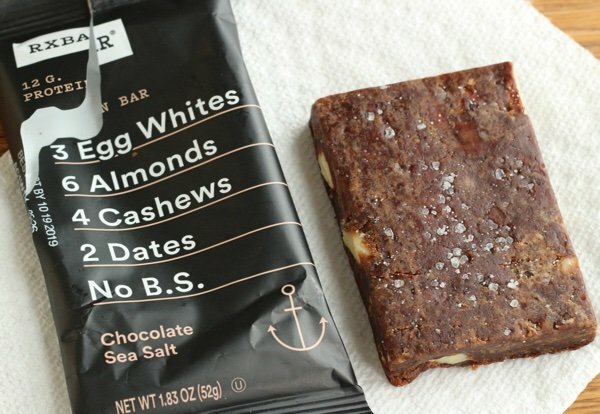 I tried the chocolate sea salt RXBAR on advice from a pal and it tasted so good. The ingredients: dates, egg whites, almonds, chocolate, cocoa, natural flavors, and sea salt - all work to create a delicious bar. I wish these were a bit smaller because 210 calories is too large for a snack BUT I do think this bar would keep you from eating crap. There is 13 grams of sugar (due to the dates) but there is also 12 grams of protein. Given how delicious it is - I am going to say it is a good choice. My second favorite isn’t exactly a protein bar but it is great for an in between meal snack. 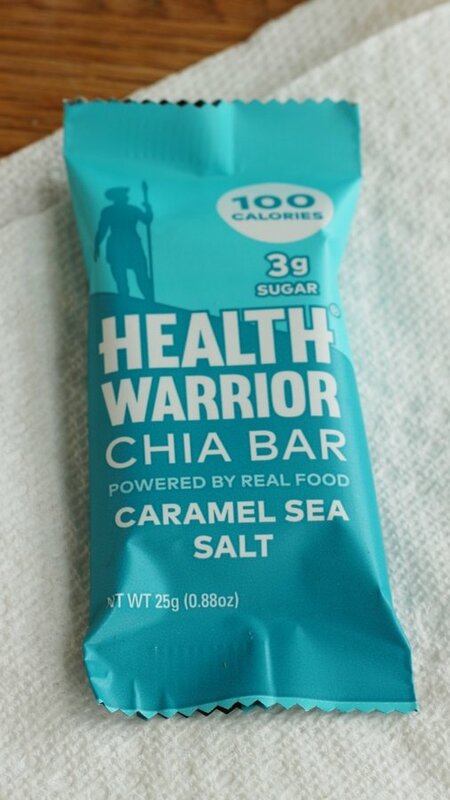 This Health Warrior Chia Bar is 100 calories (hurray!) and also low in added sugar. What I like about it is it is quite chewy - like a candy bar - and takes a while to eat. It has a great nutty flavor and I found this small bar quite satisfying. Healthy Warrior Chia Bar Caramel Sea Salt ingredients: White Chia Seeds, Cashew Butter, Brown Rice Syrup, Chicory Root Fiber, Organic Brown Rice Crisps (Organic Brown Rice, Organic Brown Rice Syrup, Sea Salt), Rolled Oats, Organic Brown Sugar, White Grain Sorghum Extract, Almonds, Arabic Gum, Himalayan Pink Salt, Natural Flavors, Mixed Tocopherols (Vitamin E). There were a bunch of meat bars to try but this was the only one I liked. Why? It tasted pretty good and has far less saturated fat than many beef jerkies or salamis. It does look a bit strange - doesn’t it? You can see why a dog might get excited when he sees this. This was only 35 calories and had 8 grams of protein! But, the downside is that they add 340 mg of sodium (14% of your daily value) which is a TOO MUCH for a food that is only 35 calories. I would be very thirsty if I ate too many of these. I would stash one in my bag though for the midday hungries. 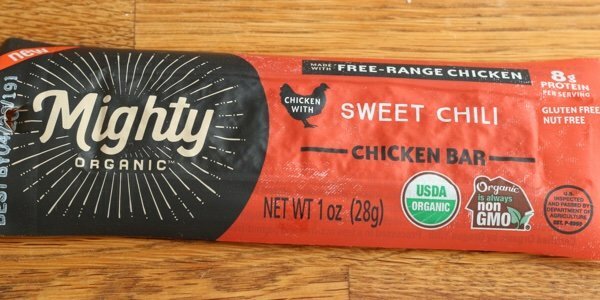 Mighty Organic Sweet Chili Chicken Bar Ingredients: Organic chicken, organic honey, sea salt, encapsulated lactic acid, organic spices, cultured celery juice powder, organic smoked chili flakes, organic garlic powder, organic capsicum extract. Please share your favorite protein bars. 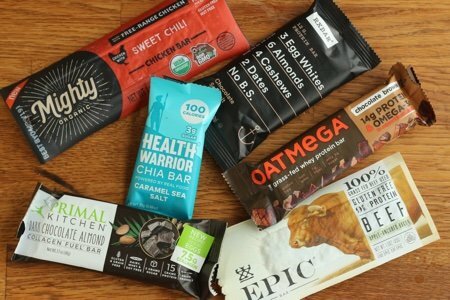 thinkThin High Protein Bars Review: Are They a Healthy Choice? Are KIND Bars Good for You? Something is wrong with the Chx Chilli bar calorie count. 8 grams of protein and 2 grams of carbs are 40 calories alone. The 2.5 grams of fat is another 22-23 calories. I buy Pure Protein Bars at Costco. 2 grams sugar, 200 calories and 20 grams of protein. Think they are the best in taste and low sugar, high protein for the price. Large box of assorted flav ors, less than a dollar a bar. Are these bars sold in Quebec? I'm on Weight Watchers and am always on the search for low point bars, which is hard to find! I LOVE Quest Smores and Cookie Dough bars. Only 4 points and very filling, and taste really good. I've also just discovered Built Bars. You can only order them online, as far as I know, and I just got my first order of Chocolate Mousse and OMG they are delicious and only 3 WW points!!! I highly recommend both of these. Pure protein bars are for sale on Amazon. The best bar I’ve found for me (vegan) is Simply One. 140-150 cal and 15gm of protein- plus they have great flavors. Downside is very hard to find so I order from Amazon. 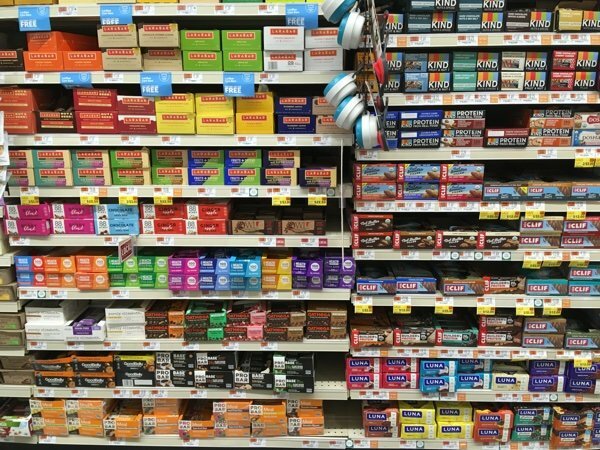 I love the Health Warrior bars, and recently found them at mty local Costco! Lara Bars - Cashew my favorite - no after taste. But I just got introduced to BUILT bars from someone at my WW meeting. Only 2 points for the whole bar, not that I would eat it at once. 110 Calories, 15g Protein, 6g Fiber, 4g sugar, 4g Fat. I purchased the Double Chocolate Mousse, Chocolate Raspberry Creme, and the Chocolate Strawberry Creme. They have a marshmallowy consistency when you bite into them - delicious. I've also tried cutting them up into 6 pieces and putting them into the freezer. Feels like a little treat to grab a piece. And someone suggested putting a piece into the microwave for a few seconds - like a smores without the cracker. I've tasted the vanilla creme, chocolate orange creme, and the chocolate mint. Even though I love mint, I wasn't a fan of the mint Built bar. I believe you can only purchase them online from the company Built Bar. ****CORRECTION - BUILT bars are 3 WW points, not 2 points. The Chocolate Premier Protein shake is 2 points - I got confused. I agree with Heather! The Chocolate Mousse Built bar has the most delicious marshmallow consistency and a really rich chocolate outside. It feels like a treat and is a good size bar for 3 WW points! I bought the thinkThin protein and fiber bar at Walgreens in January. They were Christmas flavors - Dark Chocolate Peppermint & Holiday Cinnamon and on sale for 49 cents a bar. I bought the dark chocolate peppermint. The bar was 150 calories, fat 5 grams/2 grams sat. fat, total carbs -19, dietary fiber 5 grams and sugars 5 grams with 10 grams of protein. I liked the how chewy it is so I went back and bought out the last 10 bars. The holiday cinnamon was really good too. It had 150 calories, total fat 5 grams/1.5 grams saturated fat, total cars 20 grams, dietary fiber 5 grams, sugars 5 grams and 10 grams of protein. I take these with me when I know I will be out for long periods of time. Try to find something healthy when your out is not easy so I'll take one for on the go. I recommend the Built bars also. I love that they are low in sugar and calories, but also high in protein. I got leaner just eating them for a short time. B up bars. 20 grams of protein, 20 grams of fibre and 2 grams of sugar. Several flavours. My favourites are chocolate mint (4 WW points) chocolate chip cookie dough (5 WW points). Most of the other flavours are higher points. I think the NUGO Slim Crunchy PB is the absolute best. 180 Calories, 7g Fat, 7g Fiber, 3g Sugar and 17g Protein. Awesome meal replacement. I often eat half with coffee for a snack. Chocolate brownie flavor is also great. I also love the built bars. I am half way through my sample box. I highly recommend refrigeration!! 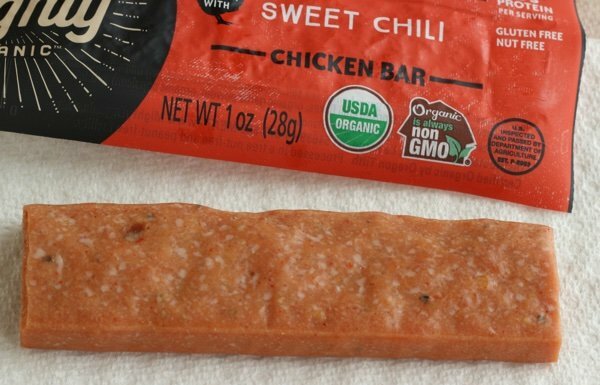 The chili chicken bar by Mighty Bar is 70 calories, according to their website and would be 2 points but they are still worth it and very tasty.